CNC TECH TALK MMS JUNE 2018 38 mmsonline.com Processes and Programming DEBURR ANY CROSSHOLE www.jwdone.com components grow or shrink, machined sizes vary. Thermally induced machine component variations can wreak havoc when you must hold tight toler- ances. Some turning centers, for example, experi- ence as much as a 0.001-inch (25-micron) diame- ter shrinkage on external diameters while compo- nents settle in to their working temperatures. A common technique used to deal with ther- mal variations is to have the machine run a warm-up program when it is first powered up and whenever the machine will sit idle for more than a few minutes. It can involve running the pro- gram without raw material for the length of time it takes to warm up. Machine tool builders vary when it comes to size variations caused by thermal characteristics. Some machines are much better than others. This should be an important factor when purchasing new equipment if you expect the machine to hold tight tolerances. • Use right- or left-hand tooling. 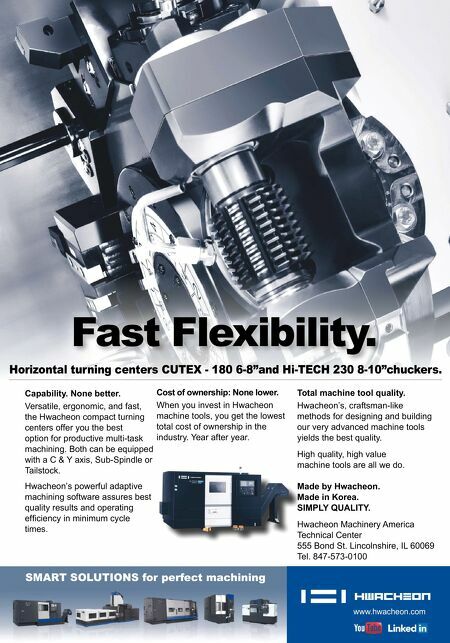 This turning center suggestion affects the machine's longevity. It is especially important for very pow- erful machining operations (like most roughing operations). Use the style of tooling that throws the force of the machining operation into the bed of the machine. For most slant-bed turning centers, for example, this means using left-hand tooling and running the spindle in the reverse (M04) direction. If using right-hand tooling for this kind of machine, the spindle will run in the forward (M03) direction, and the shearing action of the machining operation will try to pull the cutting tool away from its direction of support. Indeed, it will tend to pull the turret away from the cross- slide, and the cross-slide away from the bed. 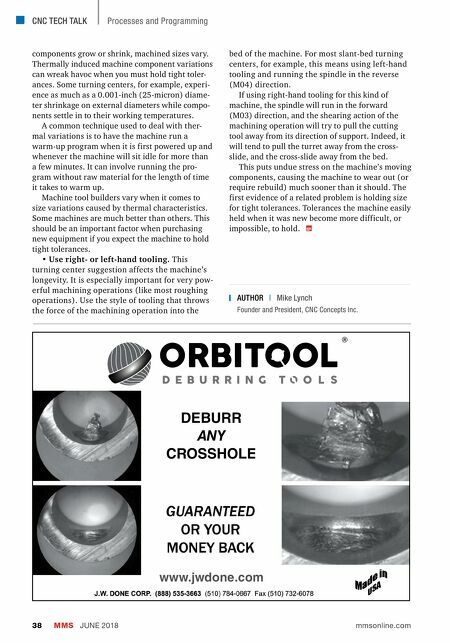 This puts undue stress on the machine's moving components, causing the machine to wear out (or require rebuild) much sooner than it should. The first evidence of a related problem is holding size for tight tolerances. Tolerances the machine easily held when it was new become more difficult, or impossible, to hold. AUTHOR | Mike Lynch Founder and President, CNC Concepts Inc.